Advance sales for “Avengers: The Age of Ultron” are equal to those of all the other Marvel Studios movies combined, online ticket broker Fandango reported Tuesday. So, we can figure it will take in around $1 billion — the combined total of the opening hauls of the 10 previous Disney-Marvel releases — when it opens in a saturation-level 4,247 theaters in North America on Friday, right? No, of course we can’t. Fandango knows that and took pains to qualify the stratospheric sales figures, pointing to its growth and the rise in popularity of advance ticketing, as reasons for the huge number. But when legitimate data becomes this outsized, it can be extrapolated beyond the outer reaches of reality. And “Age of Ultron” is generating a lot of that. Hollywood’s hyperbolic calculations are understandable, however, because “Age of Ultron” has taken us into uncharted box office territory. There are no “comps,” with exception of “The Avengers,” the original superhero blockbuster mash-up from 2012. “We’re operating in a space where really precise predictions are an impossibility,” Disney’s head of distribution Dave Hollis told TheWrap Tuesday. But that hasn’t stopped us from trying. “This movie will be the biggest movie ever. The first one opened at $207 million, and we expect this one to be even bigger and open near $240 million,” said Jaime Brugueras, vice president of analytics at Networked Insights in an interview with Motley Fool. He based his projection on the online buzz surrounding “Age of Ultron.” The social media mentions for its trailers are more than double those of “The Avengers,” “Dark Knight Rises” or any other superhero movie. As of Monday, it had 13.6 million Facebook “likes” compared to the 1.3 million that “The Avengers” had four days before its opening. Traditional tracking services have it debuting between $195 million and $200 million. No film has ever tracked that high. And “The Avengers” was at $160 million just before it debuted. Whether it matters isn’t clear, but the critics are largely sold. With 96 reviews in, “Ultron” is at 74 percent positive on Rotten Tomatoes, not quite as good as 92 of “The Avengers.” That, and a crowded weekend sports schedule with the Kentucky Derby and big boxing match Saturday night are the only negative factors that we can find. “But there was a big pay-per-view fight when ‘The Avengers’ opened,” recalled Hollis. You couldn’t ask for more momentum than was provided by last weekend’s $201 million overseas opening, which was a whopping 44 percent better than “The Avengers” did in the same markets. But if we apply that growth percentage to the original’s domestic debut, doesn’t “Ultron” open at around $300 million? It does, but “Ultron” — which added another $19 million from abroad on Monday — certainly won’t do that much. It couldn’t, right? BoxOffice.com senior analyst Phil Contrino is sticking with $216 million as his projection, and that’s where a number of other analysts see it landing. What’s clear is that no one really knows. But we do know some things about the weekend. 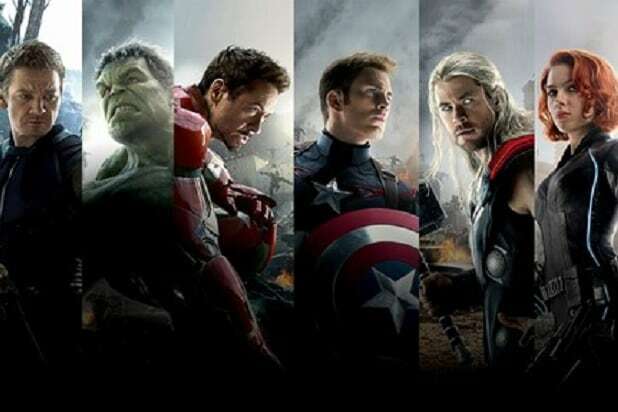 “Avengers: Age of Ultron” will become the 11th consecutive film from Marvel Studios to debut at No. 1. The other studios have cleared out and it will be the only wide release on the first weekend of Hollywood’s summer season in a box-office year expected to be the biggest in Hollywood history. Joss Whedon returns as writer and director for “Age of Ultron,” as does the ensemble cast topped by Robert Downey Jr. (Iron Man), Chris Hemsworth (Thor), Mark Ruffalo (the Hulk), Chris Evans (Captain America), Scarlett Johansson (Black Widow) and Jeremy Renner (Hawkeye). Aaron Taylor-Johnson and Elizabeth Olsen join the cast as Quicksilver and the Scarlet Witch. Don Cheadle, James Spader and Samuel Jackson co-star in “Age of Ultron,” in which Earth’s mightiest heroes take on the eponymous Tony Stark artificial intelligence program gone rogue. Kevin Feige, Marvel’s president and the architect of its sprawling “cinematic universe,” is the producer of the $250 million “Age of Ultron.” The legendary Stan Lee, Jon Favreau, Alan Fine, Victoria Alonso, Louis D’Esposito and Jeremy Latcham are executive producers. If you think you know how big “Avengers: The Age of Ultron” will debut this weekend, let us know in the comments. Because your guess is as good as anyone’s.